In a news report that could easily be the plot of a cult horror movie, an anthrax outbreak has swept the remote Yamalo-Nenets district of western Siberia, killing 1,500 reindeer since Sunday. According to NBC News, authorities think the outbreak began when some zombie anthrax thawed out of an infected reindeer corpse and woke up. It’s been an exceptionally hot summer in Siberia, with temperatures in some provinces soaring up to 10 degrees Fahrenheit above average. The extreme heat has triggered a seemingly endless rash of freak weather, natural disasters, and signs of ecological malaise, including enormous wildfires, record flooding, and natural moon bounces that might be explosive. But above all else, this week’s anthrax outbreak—the first to hit the region since 1941—signals that global warming is transforming Siberia’s lonely wilderness into a feverish nightmarescape. Thirteen members of the nomadic Nenet community have been hospitalized, while more than 60 others are being temporarily relocated to avoid contracting the bacterially-transmitted disease that is, again, believed to have blossomed to life out of a sodden corpse. Meanwhile, the Nenet community’s reindeer are dying in droves. According to NBC News, people stopped vaccinating reindeer against anthrax about a decade ago, after the region had gone half a century with no outbreaks. Authorities are now scrambling to rectify that, but it’s likely that more of the animals will die in the coming days. While the idea of frozen life forms waking up and wreaking havoc sounds borderline supernatural, scientists have been aware that this can happen for a long time. As I wrote last year, a new field of study called “resurrection ecology” has sprung up around the discovery that certain bacteria, fungi, plants, and even animals will sometimes thaw out after long periods of suspended animation—up to millions of years, if the preservation conditions are good—and go about their business again. In most cases, these resuscitated time travelers are completely benign. In fact, if scientists confirm that patient zero for the Siberian anthrax outbreak was a reindeer corpse, it’d be one of the first recorded instances of a frozen microbe thawing out and proceeding to trigger an outbreak. But it probably won’t be the last. 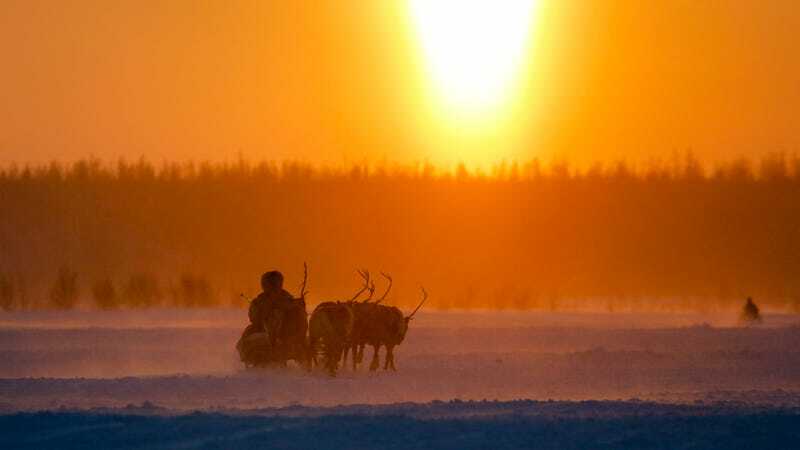 As the Washington Post notes, the Yakutia region east of Yamal is home to 200 burial grounds for cattle that died of anthrax more than a century ago. “As a consequence of permafrost melting, the vectors of deadly infections of the 18th and 19th centuries may come back,” Russian scientists ominously noted in a recent scientific paper. Man, the future is going to be awesome.